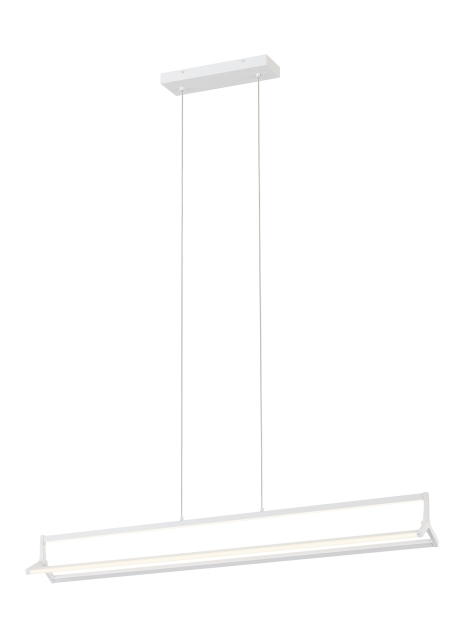 The Timbre Linear by Tech Lighting is a deconstructed modern take on a traditional linear suspension. This sleek and minimized structure emphasizes long beautiful lines of pure light. Each triangular arm features diffused acrylic-lensed LED’s for a pleasant lighting experience. This modern linear fixture is available in your choice of two on-trend finish options, matte white and matte black. The Timbre can carry into other areas of your space as this collection is available as a pendant, linear and wall sconce. The integrated acrylic-lensed LED lamps are fully dimable to create the desired ambiance using a low-voltage ELV or Triac dimmer. Includes 90 watt, 5538 delivered lumens, 3000K, 90 CRI LED linear modules. Dimmable with low-voltage electronic dimmer. Ships with twelve feet of field cuttable cable.